Hear what growers had to say about management of agriculture, energy and water use! Current practices by growers reveal a distinct interest in using technology to solve irrigation efficiency issues and to make energy‐conserving improvements. However, industry professionals who are involved with technology products for soil monitoring and control are aware of the misuse and the poor performance that some growers are receiving from the technology’s implementation. Identifying types of information, software, and hardware (including SmartMeter data) that is available to assist growers in making informed management decisions for agricultural water and energy use. 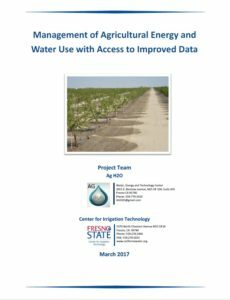 Determine the current adoption rate of energy and water management technologies that can assist growers in optimizing water use and reducing energy consumption.